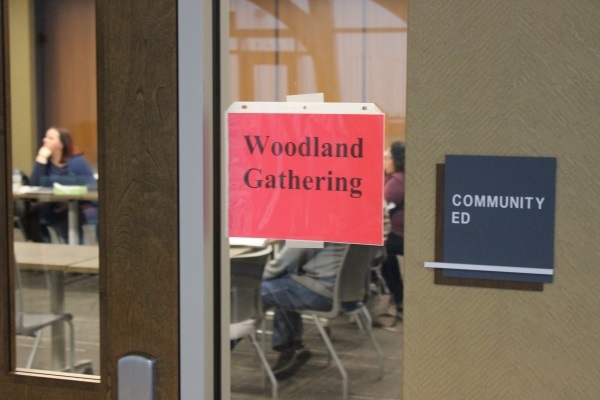 Tribal child support agencies from across the state of Wisconsin convened at the District 1 Community Center on Tuesday, Jan. 15 for the annual Woodland Gatherings summit. Directors, front line workers, financial specialists, and child support specialists deliberated on issues they face in their line of work. “We do a lot of discussion problems that we are having with the counties or with the state, and we do best case scenarios. We swap ‘what’s the best way to do things,’” said Linda Moser-Buse Director of the Ho-Chunk Nation Social Services. “The Woodland Gatherings began in 2016 after attending the Wisconsin Child support Enforcement Association (WSCEA) annual Conference. At that conference many of the tribal child support agencies realized that the issues facing their counties are not necessarily the issue facing tribes,” she said. “It was decided to meet in the fall of 2016, with the many Wisconsin Tribal child support agencies. At the first meeting we decided to include the tribal child support agencies from Michigan and Minnesota,” Moser-Buse said. Invited tribal agencies included Menomonee Indian Tribe of Wisconsin, Red Cliff Band of Lake Superior Chippewa, Forrest County Potawatomi, Oneida Tribe, Sokaogon Chippewa Community, Stockbridge-Munsee Community, Lac Courte Oreilles, Lac Du Flambeau, Leech Lake Band of Ojibwe, Red Lake Nation, White Earth Nation, Mille Lacs Band of Ojibwe, and Keweenaw Bay Indian Community. The Michigan and Minnesota tribal agencies were not present due to inclement weather. The summit began with a prayer by Travis Cloud. Ho-Chunk Nation President Wilfred Cleveland followed with a speech. “When we’re long gone, everything that we have here will continue to be intact. Our language will be stronger, more speakers, our lodges will be full, our teachings will be full when we have our ceremonies, and a sincerity that they had, we try to have, that our future generations will have, to maintain our identity as a Ho-Chunk people,” he said. “This is what this gathering here is all about, is maintaining all of this with the help of these programs to make it possible that our children, as they grow up, they could realize that they have an identity, that they have a future, that their children will be coming up and that the care is being given to them today,” President Cleveland said. “Life is grand, and I’ll feel that way when we all leave here,” President Cleveland said. The agencies then split into groups and addressed concerns frequenting in their organizations. One of the issues addressed was the process for case transfers from county to tribal agencies. When a case is transferred from the county to a tribal agency that does not use the State System, there can be problems if all of the financials are not transferred. Another topic of conversation was updating agencies’ codes. “There was a discussion on code changes for the tribes and language used in their codes was shared. This is helpful to all of the agencies,” Moser-Buse said. The Ho-Chunk Nation IV D Agency looks to the elder tribal agencies for counsel. “It amazes me how well the tribal agencies work together and how much encouragement is given to one another to succeed. This is not a big competition - we all want what is best for the children of our tribe,” Moser-Buse said.